Shinhwa has proven that they’re not only the longest lasting idol group to date, but that they still have it going strong by turning Singapore into a sea of cheers at their ‘2012 Shinhwa Grand Tour in Singapore – The Return‘. Held on June 16th at the Resort World Sentosa, the men performed to a crowd of 5,000 ecstatic fans. This was their first time visiting Singapore in six years since. Their last visit in 2006, so a considerable number of local media outlets gathered for the event to report on the concert. The interest and attention garnered from the media and their fans was a display that was said to have made anyone understand how they paved the path for Hallyu and just how legendary the group actually is. The boys will be traveling to Guangzhou on June 30th as their sixth Asia tour stop. 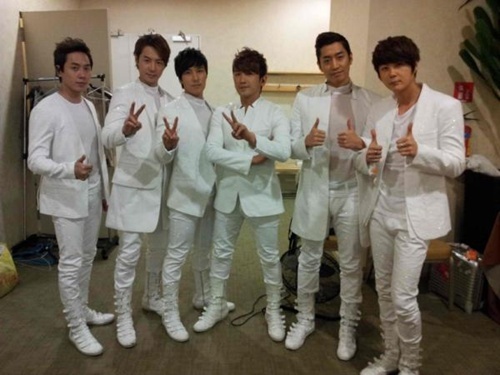 The Shinhwa members snapped a group photo in the waiting room backstage upon completing their concert in Singapore for ’2012 Shinhwa Grand Tour: The Return‘. In the released photo, the members show off their handsome looks and charisma while wearing a white outfit. Specifically, Eric, Andy, and Hyesung have their thumbs up while Junjin, Dongwan, and Minwoo flash a ‘V’ sign towards the camera. The Shinhwa members have teamed up to put on a hidden camera show against their leader Eric. The June 16th episode of jTBC‘s ‘Shinhwa Broadcast‘ will feature the special, ‘Vacation Channel – The God of MT’. On this episode, the Shinhwa members will have their first ever MT (“membership training” – usually an event held in schools where students go on an overnight trip to further bond with one another). The Shinhwa members will participate in challenges against each other during the membership training to be crowned the “God of MT”. As the Shinhwa members travel to Chuncheon for the MT, the members and the producers will cooperate with each other to deceive Eric for a hidden camera show. In order to prepare, the Shinhwa members reportedly came in two hours before the scheduled recording, and came up with the idea to make Eric bear all the punishments for the day by craftily making him the loser of every game. The members practiced their acting skills during their meeting and remarked, “The hidden camera won’t be easy because Eric is like a fox“. Will the Shinhwa members be successful in deceiving their leader Eric? Find out on the June 16th broadcast of ‘Shinhwa Broadcast’! Shinhwa‘s Kim Dongwan will play the role of a homicide detective in the upcoming horror/thriller movie, ‘Deranged‘. In ‘Deranged’, a widespread infectious disease carried by parasitic worms that induces the infected human to drown themselves spreads across Korea. Kim Dongwan will be portraying detective Jae Pil, the younger brother of the main character Jae Hyuk (played by Kim Myung Min), who tries to find the clues behind the mysterious infection. Kim Dongwan has tackled both singing and acting in the fourteen years he has been in the entertainment industry. He’s previously starred in dramas ‘Sad Goodbye‘ and ‘The Person I Love‘, and the film ‘Taekwon Boys : Spin Kick‘. His most recent portrayal of Lee Yook Sa, a famous poet and political activist, on MBC‘s drama special ‘The Peak‘ received the top award for the “TV – Drama Special” category at the Houston International Film Festival. In the released stills for ‘Deranged’, Kim Dongwan’s usual bright and playful attitude cannot be seen as he transforms into a serious homicide detective. In order to fully transform into his character, Kim Dongwan not only changed his external appearance but also spent time in a police station to observe and speak with detectives. Spectators have remarked that Kim Dongwan prepared diligently for this role. ‘Deranged’ tells the story of Jae Hyuk, a pharmaceutical agent who desperately tries to find the cure to a deathly infection as an increasing amount of people including his own family become infected, while Jae Pil, his younger brother, helps in the investigation of the outbreak. ‘Deranged’ also stars Honey Lee as Jae Pil’s fiancee and Mun Jeung Hee as Jae Hyuk’s wife. ‘Deranged’ is planned for released on July 5th. Idol group TEEN TOP who recently released a standing version MV for their new song “To You” has also released a dance practice video! Though out of breath from many repetitive rehearsals, the boys keep a positive attitude as they power through what seems to be their final practice dance of the night and nail every move. Check out the dance below, as well as ‘zebra’ L.Joe‘s leopard-print fashion. On the June 7th episode of PalmTV‘s ‘IdolTV Smash‘, idol group Smash did a hilarious parody of ‘Brave Guys’. In their parody, Smash’s Youngsuk revealed, “You think we’re rookies, but we’re actually sunbaes of 2PM by one week.” Member Jungsu then commented, “Nobody knows about this.” 2PM and Smash debuted together in 2008. Leader Hyunjoon stated, “Show [the parody] short and sweet. 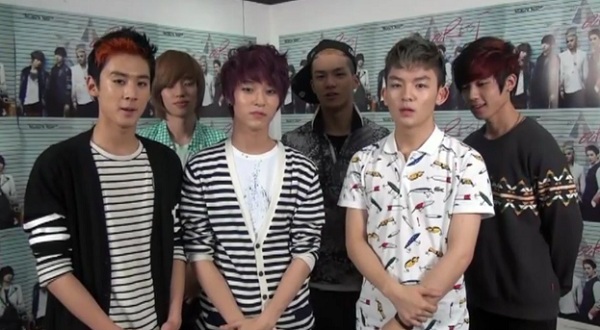 TEEN TOP! Your agency’s president and I are of the same age,” referring to Shinhwa‘s Andy. Hyunjoon was actually born in 1980, and Andy was born in early 1981. Smash also jokingly commented on Tony An‘s birthday, “We’ll give you money so buy yourself ice cream. You’re running a food business lately. We ate dinner at another restaurant today,” showing their comfortable relationship. Tony An and Smash collaborated for Smash’s latest album and recently completed their promotional activities together. Will Shinhwa’s Andy betray his own group? Shinhwa‘s maknae, Andy, betrayed his fellow members by becoming a proud member of SHINee. The June 9th broadcast of jTBC‘s ‘Shinhwa Broadcast‘ will air the second half of “Guest Channel – Shinhwa & SHINee”, in which the two groups once again compete against each one another. On last week’s episode of ‘Shinhwa Broadcast’, Shinhwa and SHINee competed against each other in a round of badminton and “Vaulting Horse”, in which Shinhwa stole SHINee’s Taemin while SHINee stole Shinhwa’s Andy. For the third competition, the two groups will fiercely battle it out in a game of “King Chicken Fight”, in which each team must try to knock down the “king chicken” of the other team. 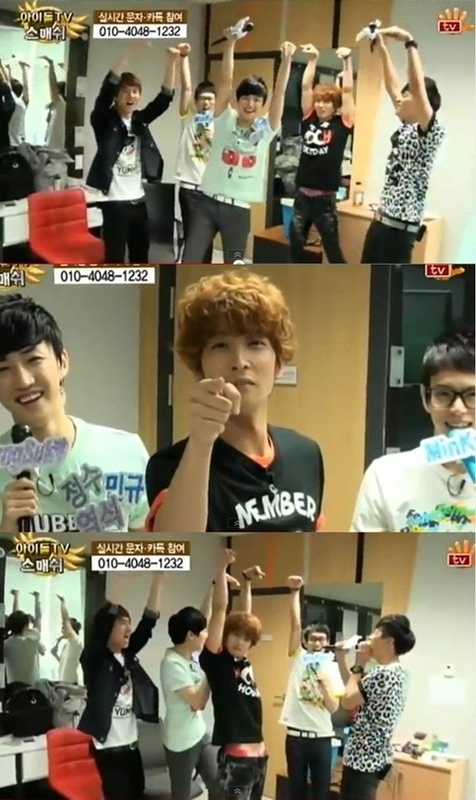 As each team huddled together to develop a strategy before the start of the game, Andy shouted towards his former team, ”I will single-handedly take down all of Shinhwa!“, showing off his rebellious nature. Additionally, during last week’s episode when Andy was chosen to be a part of SHINee’s team, he caused the other Shinhwa members to feel betrayed by cheering excitedly and throwing his orange (Shinhwa’s color) jersey on the ground. Find out if Andy was able to take down his own Shinhwa members on the June 9th episode of ‘Shinhwa Broadcast”. Comments Off on Will Shinhwa’s Andy betray his own group? Triple S across the globe are celebrating the seventh anniversary of group SS501. 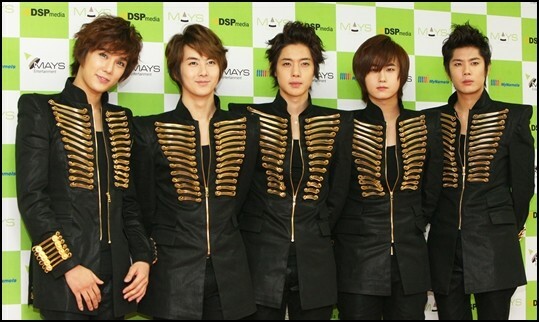 SS501 who performed their very first music stage with “Warning / Everything” through KMTV‘s Show! Music Tank back on June 8th of 2005 are celebrating their 7th anniversary today. Although the group members are focused on their solo activities and under different agencies, much like Shinhwa, fans are patiently waiting for the day they can return together as one. In celebration, fans are trying to trend the hashtag #Happy7thSS501. For a trip down memory lane, you can watch their debut stage from 7 years ago below. Shinhwa‘s Andy has been selected to lead an entertainment news program. Andy began hosting SBS E! ‘K-STAR News‘ as of June 4th. Thanks to his experience hosting a program during his military career, Andy is expected to fulfill the role well with witty commentary and smooth transitions. 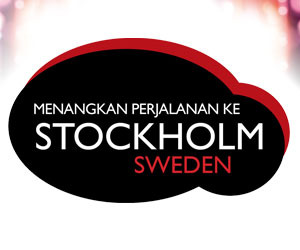 ‘K-STAR News’ is a global entertainment magazine news program that airs the hottest news from Monday to Thursday. “I am nervous to be hosting a live program, but I am excited at the thought of meeting with the viewers everyday. I will do my best to host the show as smoothly as possible,” the singer said.